It’s move in day and there is excitement abound. A new home to make and a lot of work ahead So how exactly can you go about making your home ready without all the added stress? First of all, congrats on the new home! While moving into a new house can be a source of excitement and celebration, it also has the potential to be stressful and overwhelming and even more so if you are unprepared. Whether it’s your first move or your twentieth, the key to reducing the stress you’re feeling when preparing for your new home is to arm yourself with proper planning. The following tips will make sure you have a good handle on everything and make the entire process simple and streamlined for your new home. A friend of mine had a very uncommon experience when they moved houses. While the family were busy unpacking their things, the previous homeowner just walked right through their garage. Having someone, other than your family walk in to your home is the last thing that you’d expect during your move. To ensure that you do not compromise the safety of your new home, here are a few tips to consider. Change your locks. If you’re not moving in to a brand-new house, there is no way to know how many sets of keys the previous homeowners left around the house, having a new set of keys would give you the peace of mind. New keys would mean that the previous owners won’t have access to anything anymore. Firstly, it’s easy to forget to close the garage door while you and your family continue unpacking your things and settling into your new home. Leaving the garage door opened displays everything your house has and for all those driving and walking by to see all the boxes from your latest TV sets and home entertainment for everyone to see. Second of all, you should also change the garage door codes for the same security reasons. You may want to check if the previous homeowners had a security system installed and check if you can have it reprogramed or activated. Third and finally, have a garage door maintenance check performed on your garage door before or just after moving in. Maintenance checks give you the peace of mind that your units operate properly. Before moving day, take some time to go through the blueprint, floor plans, and photos you have of your new home. Measure all interior spaces, furniture, hallways and decide where the best places for things to live. Correct measurements help you know what items will fit in with the size and décor of your new home and what needs to go. By doing this far enough in advance of your moving day, you will leave yourself plenty of time to know should you need to toss, sell or give any ill-fitting items. One of the most tedious and stressful tasks during a move is packing and labelling things. There seems to always be endless things that require packing and not enough time in the day. If you think your strategic labelling, skills are behind you after you have packed and closed your last box, think again as you will need to use that same skill while prepping your new home for the move. Before moving your belongings in, you can designate where everything is going before you start. Take some wall friendly tape, label each room’s door and where each item or circuit breaker should be placed. This will make sure that each box and all the furniture arrives at its proper destination. By doing this, it will not only help you save time and energy shuffling boxes around, it will also be a tremendous help for movers and helpers alike. Even if your house is brand new, you might still want to want to do some cleaning before moving in. It may not likely require the deep clean as some older homes do, but it is likely that contractors, builders, and construction workers have left their mark while building the property. If you are moving into a previously owned home they can go through a lot of wear and tear and deep cleaning would help you reach spaces that might be neglected during routine cleaning. 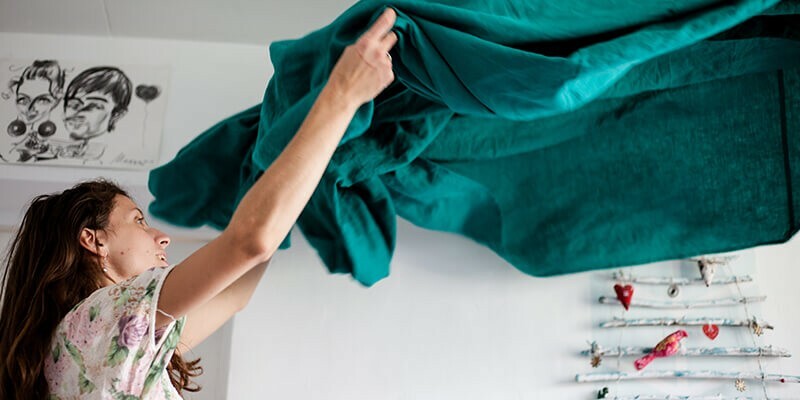 For a stress-free move in day, cleaning should be the last thing you do before the movers arrive. We know that some cleaning will be required after move-in but doing all of the major work is much easier to do if you are working with an empty house. Just because you don’t see any of these creepy critters in broad daylight, it doesn’t mean they are not there or won’t show up once you have moved in. If you want to avoid hundreds if not thousands of uninvited guests sharing your house, then calling your local pest controller is critical. Calling in the service prior your move in day will allow the pest control service to spray more thoroughly with less obstacles than doing it when all your things are inside the house. This also eliminates the risk of exposure to harmful chemicals as the spraying will be done while the house is still empty. You can opt to use the same provider that the previous owners had since all the equipment will already be present. Before you move in, take a quick picture of the utility meters and jot down the readings. This can be compared to your first utility bill to make sure everything lines up properly. This will help you ensure that you are not charged for someone else’s use of the utilities.